Story of Yanxi Palace <延禧攻略> outperformed all expectations and became Mainland China’s hottest drama in 2018. The show propelled Wu Jinyan (吳謹言) and Xu Kai (许凯) to stardom. Producer and screenwriter of the drama, Yu Zheng (于正), the screenwriter and producer of the show, said that he will be bringing back the production team behind the hit drama for his upcoming project, The Side is Not Begonia <鬢邊不是海棠紅> (tentative). Slated to start filming at the end of November, Yu Zheng updated his Weibo account with some preliminary information about this upcoming drama. Because the nature of the drama revolves around the traditional Beijing opera, the series is already being dubbed as the television edition of the popular movie, Farewell My Concubine <霸王別姬>. 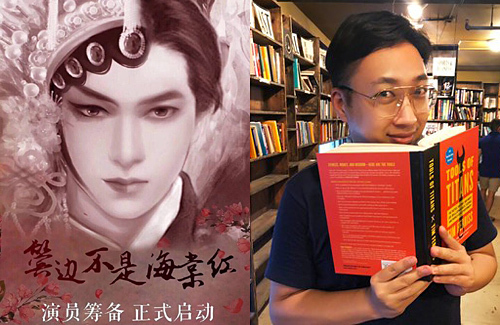 Expressing his love for traditional Chinese arts and heritage in his latest Weibo post, Yu Zheng revealed that he always tries to incorporate these details into his work, hoping to spread the knowledge and passion onto the younger generation. On the addition of artistes to the upcoming drama, all Yu Zheng ended up revealing was that one of these mysterious actresses is a highly recognized and reputable figure in the film industry.